The following is a no-spoiler review, as I assume many of you may be waiting for the film to hit the big screen, and I wouldn’t want to reveal any cinematic surprises. We first mentioned The Numbers Station back in late 2011 –and admittedly, I was eager to see public attention drawn to this public-yet-covert shortwave communications medium that’s still in existence today. Indeed, it’s no wonder that a numbers station became the subject of a film; the subject is truly mysterious. Only a few days ago, while describing numbers stations to a visiting friend who had never heard of them, I played a recording of a numbers station that I made last year–her initial response upon hearing the recording was, in her words, that she experienced “chills” running up her spine. But what is a numbers station? 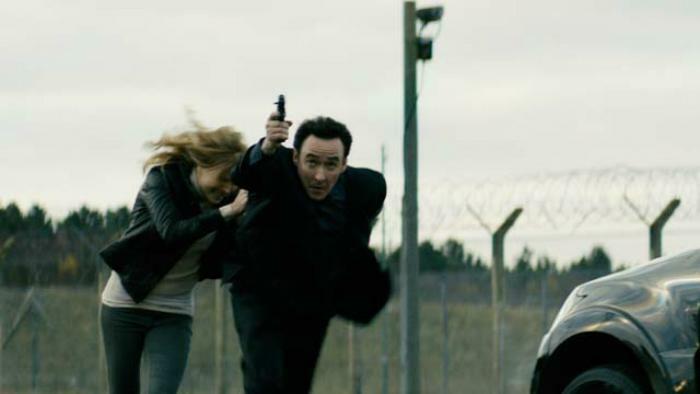 In the movie The Numbers Station, John Cusack’s character, Emerson, is a seasoned field operative–a “black-ops” agent–who faces a life-changing dilemma in the field which places his career in jeopardy. In an attempt to give Emerson some time to reconcile his emotions, his leader (Liam Cunningham) assigns him to what should be a simple, routine assignment: to protect Catherine (Malin Akerman), a cryptologist who broadcasts at a rural remote numbers station in the UK. Things go terribly wrong when the station is compromised and Cusack finds himself again facing the same dilemma that sent him to this assignment in the first place: whether to “retire” his asset (namely, Catherine) in order to fulfill his duty, by cutting off loose ends? Or will his conscience–and tenuous friendship with Catherine–take him in another direction? It’s a difficult ethical dilemma, one Emerson has been attempting to avoid. 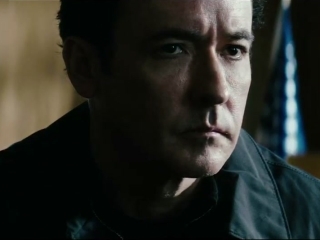 I’ve seen a number of John Cusack films over the years, and while he’s an extraordinary talent, The Numbers Station unfortunately doesn’t quite allow us to see his full range as an actor simply because his character, Emerson, is stoic and quite introspective. But the chemistry between Emerson and Catherine is complex and tense, and one can’t help but believe he cares deeply for her. On the action front, The Numbers Station is a much greater success: pacing is good, with a few moments to collect your breath; still, there’s always looming conflict. The bulk of the film is set in a dimly lit, underground bunker-come-numbers station, and there are actually very few shoot-’em-out scenes, yet the tension and suspense are constant. I won’t comment on how the plot resolves, but I can say that if you like dark films with tension, moral decisions, action, and intrigue, this is well worth watching. I enjoyed it. Moreover, if you love shortwave radio, and are intrigued by numbers stations, you will be pleased to discover that this film treats the concept with due respect and more accuracy than I would have anticipated. How accurate is The Numbers Station? While those who write about numbers stations have presumably never worked for one, there’s an existing body of knowledge out there built on thousands of hours of listening, cataloging stations and even court documents from cases involving spies. This gives us a fairly accurate idea of the true nature of numbers stations. Though it is possible, I have never heard of a numbers station which has a live voice behind the microphone, reading numbers; these would most likely be advance-recorded or computer generated. In the film, Malin Akerman’s character, Catherine, only seems to read a string of numbers for a matter of seconds, not minutes; in reality, this would take much more time. I heard no preamble of numbers to ID the correct decipher key. In the film, under standard operating conditions, no one at the station knows the nature of the messages being broadcast–this reflects a probable fact about such stations. The numbers station is located in a rural and remote part of the UK, a convincing setting for a numbers station (though some may broadcast from major broadcasting sites). 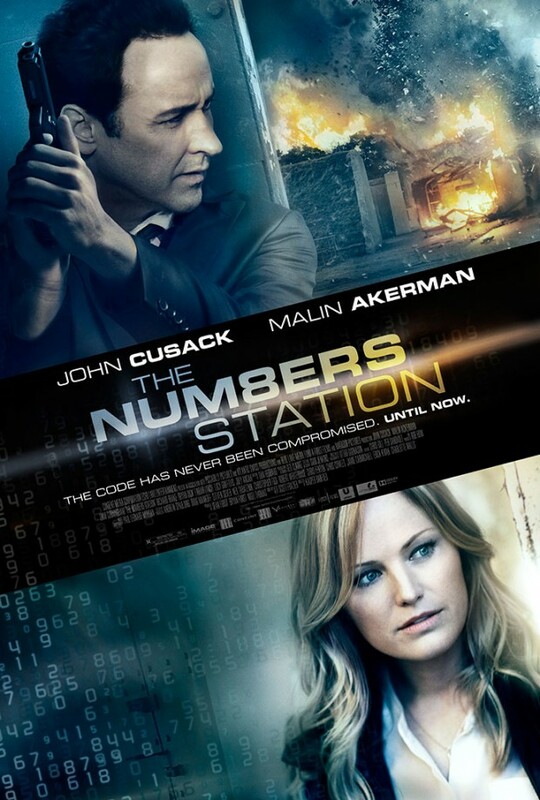 Once the station has been compromised, Cusack’s character explains in some detail how numbers stations work on the operative’s end; this description is very true to what is known or believed of actual numbers stations. So, should you see it? I anticipate that most any shortwave radio enthusiast will enjoy The Numbers Station. As a non-movie-reviewer–in other words, as a regular joe public movie-goer–I give it 8 stars out of 10. Go ahead! Click here for show times and on-demand viewing. If you’ve seen The Numbers Station, please comment below. This entry was posted in Current Events, News, Numbers Stations, Reviews, Shortwave Radio, Videos and tagged John Cusack, Malin Akerman, Movie Review, Numberes Station Trailer Clips Featurette, Numbers Stations, Reviews, Spooks, spy numbers stations, The Numbers Station, The Numbers Station Movie Review on April 25, 2013 by Thomas. I noticed that “The Numbers Station” is now available on Netflix streaming, so I watched it last night and I really enjoyed it. A few months ago I interviewed a woman who was a number reader in Taiwan in the 60s and early 70s. She worked at Voice Of Free China (today Radio Taiwan International). She said in 1965 she was asked to read a series of numbers by someone from the National Security Bureau. Over the next ten years she did this weekly. Then in 1975 the NSB stopped coming by VOFC. She later discovered later they had taken recordings she made and put them in a machine. Very cool! Did you record this interview by chance? Was it in English or Chinese? If you had a link that would be great. It was in Chinese and about 1 hour. So translating it is taking some time.